I just shared an amazing and simple recipe for Chipotle Butter with you, and now I'm here to tell you one of the many things to use that glorious butter on. Oh how I love spring and summer and busting out the grill so I can indulge in some grilled corn on the cob. There's almost nothing better. And grilled corn tastes delicious with some regular melted butter of course, but why not amp that goodness up a bit? Ok, a lot! 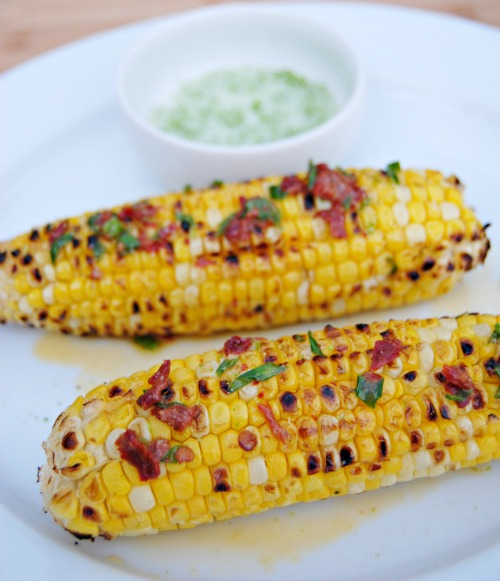 Grilled corn on the cob + Chipotle Butter + Lime Salt. Add kosher salt and lime zest to a small bowl and stir to combine. Set aside. 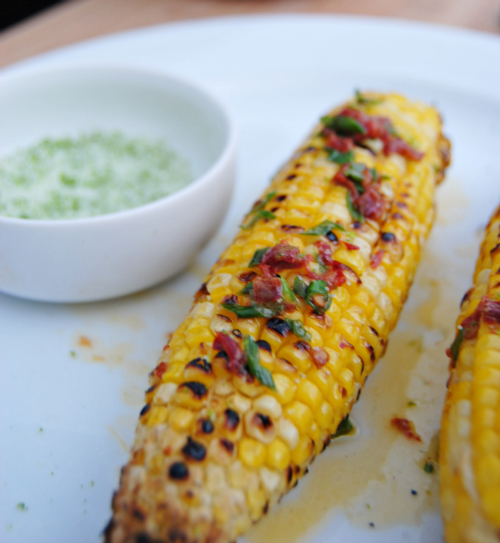 Grill corn directly over medium-high heat, turning occasionally until browned and slightly charred on all sides. I hope it's starting to feel like spring over in your neck of the woods. Today it's 79 degrees and sunny here in Cincinnati and I'm loving every minute of it! this sounds soooo good. esp the lime salt.. why didnt I think of that?? I completely want to jump through the screen. Looks SO good! I'm loving every minute of this weather too! Finally! You got me ready for grilling season! I love grilling corn, but have never made a flavored butter! Totally trying this, can't wait! 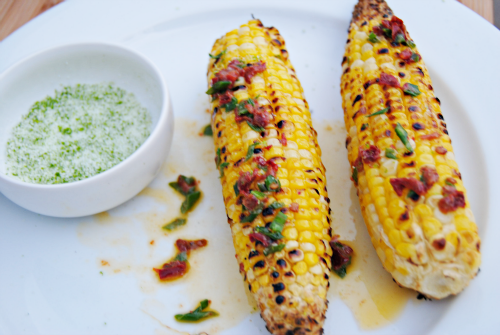 Oh my gosh I am dying- I love grilled corn and I can't wait to try this out! Pinning! That corn looks sooooo good! Just FABULOUS! Thank you very much for sharing with Full Plate Thursday and have a great week! I'm ready for this but our summer corn isn't here yet. The stuff in the stores is pale, low in quality and $5.99 for a five pack of corn! Oh, this looks good. I'll try your recipe the next time we grill corn. This recipe looks really yummy and really makes me hunger for summer!!! WOW! WOW! WOW! I am going to have to try this soon! 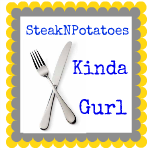 Thanks for linking up to Sweet & Savory Saturdays #8. Firing up the grill right now. Ok, not really cause it's 9 PM, but I want to! Something grilled is going on next week's menu just for this corn. I have a freezer full of corn from last years farm pick up! I know there will be a lot of corn on my menu and all of it will have the Chipotle Butter and lime salt on it! Great combination of flavors! 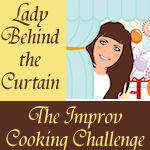 Thanks for linking this to the In and Out of the Kitchen Party. I can't wait to see what you bring next week. Anxiously awaiting the warm weather to try this!! Thank again for sharing on Simple Supper Tuesday. Thanks again for linking up to Much Ado About Monday! I seriously LOVE grilled corn and can't wait to try this out as the weather continues to get warmer! You are a Featured Favorite on Saturday Show & Tell on Cheerios and Lattes this weekend! We love having you join us and can't wait to see what you've been up to this week! Have a great weekend! 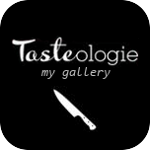 Popping over to say that this will be featured when See Ya in the Gumbo goes live tonight. One of the most-viewed links! Thanks again for joining in. 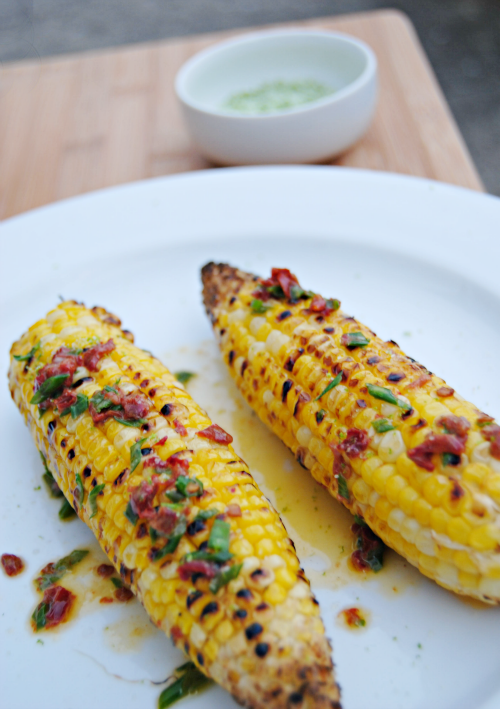 Thank you for sharing this colourful and spicy way to serve corn with the Hearth and Soul hop. Hello, Desi! Stopping by to let you know that I featured your Grilled Corn in a Memorial Day themed blog post today! http://www.chattingoverchocolate.com/2013/05/memorial-day-pinspiration.html ...Thanks for sharing this DELICIOUS recipe and Happy (early) Memorial Day!! Pinned the recipe last week and then made it while camping! The corn was delish, and everyone raved about the chipotle (even tho some were skeptical)!!! Thank you for a great recipe!